The Goat Food God … The Lord of the Hunt … Swift footed, keen eyed … To be approached with laughter and song … God of madness, dreams and healing … Sending armies mad and persuading young women to go on living … Beloved of all the gods, yet never resident on Olympus … Pan presents the modern reader with a series of, if not contradictions, then puzzles. Who was this deity – and who was he thought to be? What were the people who honoured him like, and why did they seek him out? In The Goat Foot God, Diotima takes a scholarly yet idiosyncratic look at Pan, as is only befitting the subject. Using the Homeric Hymn as a base, and moving beyond it, she examines what the ancients knew and thought about Pan. She moves on to the present day and finds no less puzzlement, asking how Pan might fit in with the modern feminist consciousness. There are more questions than answers herein, but that is entirely in keeping with the eponymous subject …. About the author: Diotima is the author of many articles, short stories and poems. Her work has been widely read and published, in magazines, online and in collections (The Best of Konton, He Epistole). Her previous books, Refuge: Tales of Myths and Magicks, and Banish with Laughter: Essays of Myths and Magicks and Dancing God: Poetry of Myths and Magicks, have explored topics as diverse as the building of community, the construction of ethics, eclectic belief structures, the history of mythology, to fiction set from the earliest days of the gods through to the present day. The Goat Foot God can be purchased from Amazon here or Barnes and Noble here. All of the proceeds from The Goat Foot God – as well as many of the other volumes in the Bibliotheca Alexandrina series – will be used to help promote the revival of the worship of the Greek and Egyptian gods, with a portion of the proceeds given to a worthy charitable organization in their name. So, not only will you be getting a wonderful book of poetry about the Gods – but your money will be going to do good work and help the revival of ancient polytheistic religions. 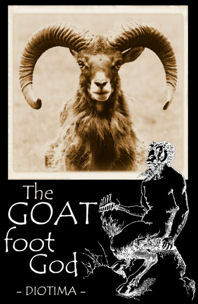 ATTENTION BOOKSELLERS: If you would like to carry The Goat Foot God in your store please contact us. We are willing to sell you copies of the book at a significant discount in order to make it easier to distribute The Goat Foot God as widely as possible. Please direct any inquiries to baeditor@gmail.com for more details. Reviews can be found on The Druid Network, Facing North, in Pentacle Magazine, and on the Executive Pagan blog. Lupa and Mike Gleason have both written reviews, and it is on the Witch of Forest Grove’s reading list. A new review has just been posted on GoodReads.